This is a tiger shark looking for a reef with fish for him to eat for lunch. It’s my dad’s birthday today and he likes tigers, so I thought that I would write about tiger sharks as they are cool as well. They are named after the stripes on their sides which fade as they get older and bigger. 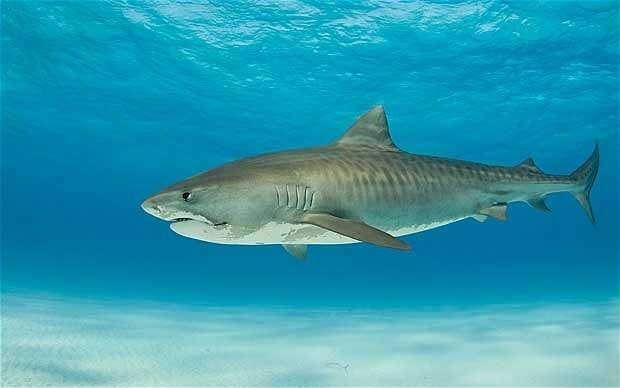 Tiger sharks are one of the biggest sharks in the world and have been measured at up to 5.5 metres long. They have a massive appetite and will eat almost anything, including fish, sea turtles and marine mammals, but will also eat human rubbish. Car licence plates, baseballs and car tyres have been found in their stomachs. Tiger sharks have special teeth that are serrated for sawing and cutting through the toughest prey, especially turtles. Like other species of sharks, they are able to replace their teeth with rows of new teeth. They are found near the coast all around the world, especially in warmer waters. Are there any other interesting facts that you would like to share about tiger sharks?